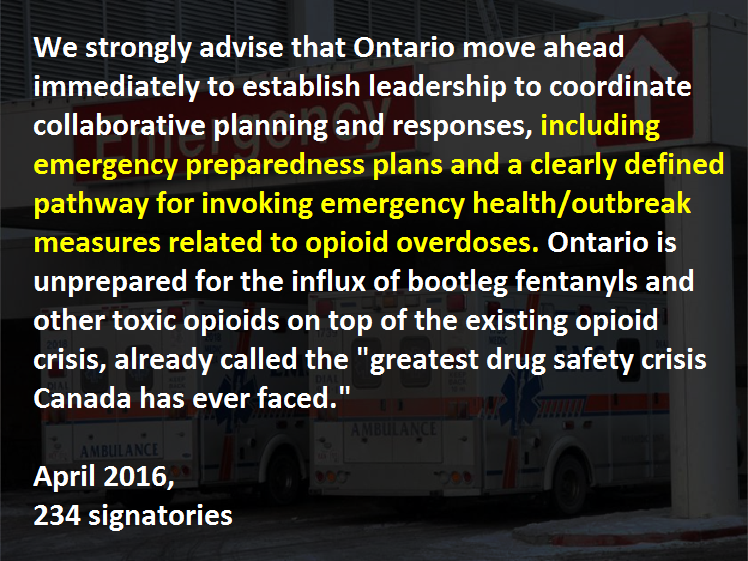 Bootleg fentanyls (NOT pharma-produced) were first detected in Ontario in 2013. Bootleg fentanyls and opioids are of high potency and now present in a variety of substances: pressed into fake pills (Oxy 80, CDN 80, A215, Xanax etc. ), and as powder exclusively or mixed into heroin, cocaine, and crystal meth. People using substances occasionally and daily are at risk. Many if not most people will be unaware they are consuming bootleg opioids. An opioid overdose victim can not save themselves. The onset of overdose from a small amount of bootleg fentanyl(s) is rapid. Naloxone administrations exceeding 2 x 0.4mg/ml doses may be required to resuscitate. Most people engaged in illicit substance use will not call 9-1-1 during a medical emergency due to fear of criminal justice sanctions. Deaths from bootleg fentanyls in Alberta have risen 5,700% for the period 2011-2016. British Columbia has declared an overdose public health emergency. 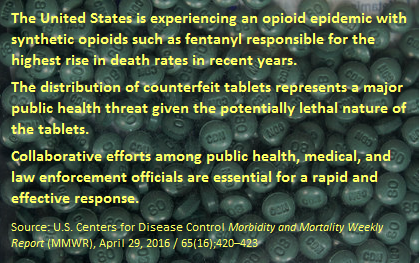 Many U.S. states are experiencing a rise in (bootleg) fentanyl-detected deaths. ﻿Serious Risks from Emerging Opioid: Fentanyl Analogues. 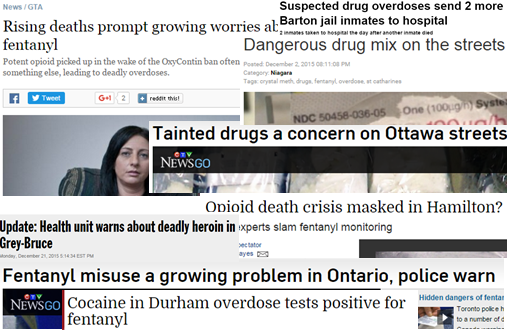 Ontario 2013.